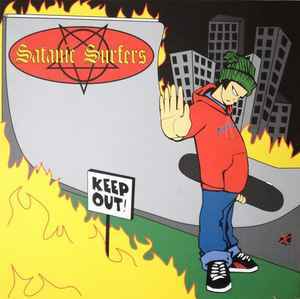 Satanic Surfers ‎– Keep Out! © ℗ 1994 Burning Heart Records, licenced to Effervescence Records. Recorded at Studio Underground, Västerås 1-4 Aug 94. Red/orange swirl vinyl limited to 250 copies out of a total pressing of 1000 copies. The first 500 records sold include a poster regardless of color version. Tracks are listed sequentially over the sides. Pressing plant uncredited, identified by the matrix numbers.